Some bands just keep rolling along without nary missing a beat. Such is the case with the progressive rock legends Yes. The band just released their twenty-first studio album entitled Heaven & Earth this week (US release on July 22). Currently on their summer tour coinciding with the new album, the band is playing two complete albums. The band is performing Fragile for the first time ever from beginning to end and Close To The Edge in full as well. As the band took the stage Friday night one could see from the set up on how much goes into a Yes setup. Looking at the stage from the crowd one could see guitarist Steve Howe flanked on the left with keyboardist Geoffrey Downes faced the back of the stage most of the night with the way his keyboards were set up. Drummer Alan White had bassist Chris Squire to his left with singer Jon Davison to his right giving everyone ample room and space to do as they wished. Having seen the band a few times I knew what to expect from Squire who is the only one who has played on every album as well as the lone original member touring with the band. Guitarist Howe perhaps had the most memorable moment of the show during his instrumental “Mood For A Day”. The surprising member was Davison who now with a few tours under his belt seems very comfortable up on the stage. The band started this night off by playing 1972s Close To The Edge but as Squire announced they had done so in reverse order. “And You And I” was the musical high point during the near forty-minute performance. The band followed up with a pair of cuts from their Heaven & Earth release in “To Ascend” and “The Game”. 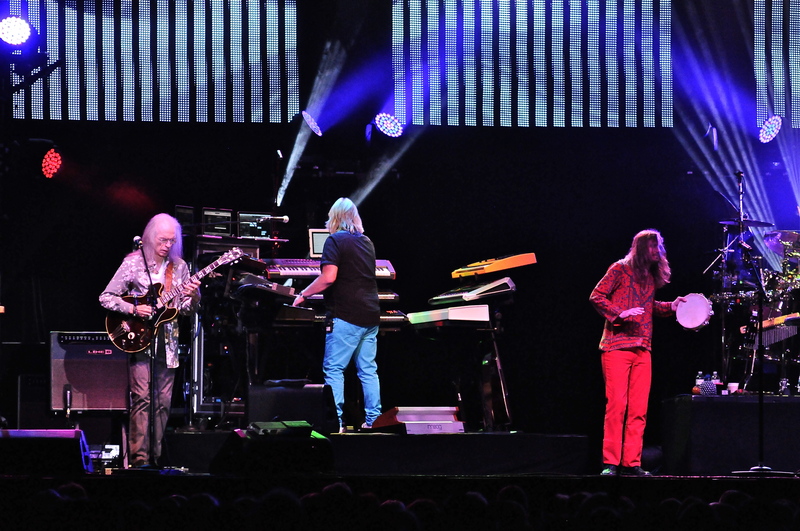 Fragile was up next and began with the Yes classic “Roundabout” and ended with the stellar “Heart Of The Sunrise”. Fragile was a great choice for the band to cover because it was their breakthrough album. It also was the first to feature famed artist Roger Dean who has gone on to do many album covers for the band. The band has been mixing up the encore from show to show. On this night they came back out with “Long Distance Runaround” and “Owner Of A Lonely Heart”. “Owner Of A Lonely Heart” has a history for knocking music legends Michael Jackson and Paul McCartney’s “Say Say Say” from the number one spot in 1984. After hearing the band perform the two classic albums perhaps something a little less commercial like “Starship Trooper” would have been a more fitting way to close out the show. Members may come and members may go with Yes, but they always seem to keep the ship moving forward and deliver fantastic albums and concerts. While the arena playing days of the eighties may be long gone along with original singer Jon Anderson, the fans still anticipate the new albums and the tours. It’s a love affair for the great music the band has made over the years that keeps bringing the fans back for more.